A young orphaned boy raised by underground cave-dwelling trash collectors tries to save his friends from an evil exterminator. Based on the children's novel Here Be Monsters by Alan Snow. Have not seen this but it just seems like films like this would be better served using real voice actors, all these folks are talented but not a one is a Mel Blanc or Nancy Cartwright. I did stop and look over the poster, it may be fun or it may be saccharine, the theme does seem like it would have been well served by hiring the Brothers Quay as consultants. I saw this last night and loved it to bits, frankly. Definitely not saccharine. A really thoughtful exploration into important topics such as fearmongering, power-lust, class politics, patriarchy, human morality, etc. etc. Go see it. Stay for the song during the credits and the stinger. This is possibly the most progressive "kids" movie that I've ever seen. This has been out a while now this side of the Atlantic. Went to see it a couple of weeks ago and loved it. One of the best films of the year I'd say. Yes, you know where the storyline is going, but it isn't bout spoilers and plotlines, it is about enjoying the journey of getting from here to there. Loved the character design and the whole look of the film. And I'd agree with mrjohnmuller, stay for the credits. Well worth it. I was really impressed with the voice acting and the perfect animation. The world was so richly done, and sometimes so disgusting (on purpose) that I had to shut my eyes. I was reminded of Fungus the Bogeyman, a story that would have fit perfectly for Laika's creative team here, if anyone wanted to make a good movie of it, which sadly it seems they don't. Still, I prefer Paranorman and Coraline. I thought the social messages here were heavy-handed, and there were too many plot holes. I'm also puzzling over whether I should support an impassioned and much-reblogged opinion that the movie is transmisogynist, since the villain accomplished his plot in part by dressing as a woman. I disagree, but since I'm not trans, I also know that my opinion doesn't carry so much weight here, and I think it's worth considering. Had you seen this, you might not have made that comment. In particular, Ben Kingsley's voice work is nonpareil. He adds to his character an especially telling touch, and it's entirely done vocally. His character is lower class, but a striver. Like many lower-class characters, he drops his h's, but because he's putting on airs, he puts them back in again. However, he doesn't know exactly where they go, so he just sort of sticks them in front of vowel sounds that might have an h in front of it. It tells you a lot about his character -- that he wants to better himself, but is bound to fail, and that failure will be both ridiculous and grotesque. I have to say I'm warming to 3-D movies. I don't know whether people are getting better at it or I'm just "catching on" late. 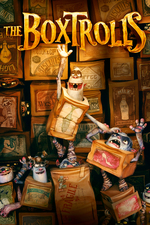 Boxtrolls used the added dimension very well. 3-D was used effectively to add to the comedy, to the pathos, and to moments of tension all of which were in abundance in this funny, moving film. I have been eagerly awaiting this for months. We just left a screening, and I can already tell I'll be wanting to go again. I loved how unafraid it was of being gross, and how fully the place was realized. Also, the Doctor Who joke was great! I take my daughter to every kid movie that comes out, since it's only about one per month at most. The good ones I enjoy the heck out of, the bad ones, I end up falling asleep (looking at you Planes, which enabled a nearly full 90min nap). My daughter and her friend thought it was just ok, and unfortunately I slept through the middle 30 minutes of it. It was just so-so for me, it had a lovely character design and aesthetic, but the writing and humor were kind of predictable. The advance screening I went to was criminally under-attended, I think because most people didn't know what it was--a few clearly did, and had brought their kids, but I think a lot of people were there just because "Hey, free screening." My partner (whose workplace offered the screening) knew so little about it he wasn't even going to mention it to me until I asked, "Hey, any chance y'all are going to get a Boxtrolls screening and if so can I pretty pretty please be your plus-one?" So I hope the reviews help promote it better than it has been, because OHMYGOSH it was absolutely delightful and magical and fun and I loved it so very much and I can't wait to see it again. Everything Laika touches is pure magic, and Boxtrolls reminded me so much of early Muppet stuff, in terms of being astonishingly well-crafted and well-performed, fun for everyone, and incredibly, delightfully subversive. What a lovely film. It followed the usual Laika flow for movies for me, where the early part is more for the kids as adult themes are laid out. Then the finale brings both "sides" to fruition and I'm satisfied with the way the adult and child sides interweave. Loved the way the world was perpetually off kilter with no straight lines or perfectly formed shapes. Also the way it gleefully reveled in being gross was delightfully disturbing. That final musings of the two henchman was beautifully perfect. Nice work, I second the motion of staying through the credits. I really liked it, but also had a weird moment in which I realized that it was basically The Amazing Maurice and His Educated Rodents with some bits changed. I was really, really impressed with the production design and creativity. It felt like the filmmakers went above and beyond, and their love of the material showed through. Ben Kingsley was amazing as well. I haven't actually seen the other Laika movies, but now I have to.